I remember when I was praised for being such a ‘polite little girl.’ Older aunts, uncles, family friends and my parent’s coworkers admiring my practiced inquisition as to how they were, or the eye contact and smile that were just second nature when it came to responding with manners when spoken to. I was taught manners as though it were a religion of its own. Sit up straight, don’t chew with your mouth open and be polite. Those were the rules. They were simple and clear. You don’t ignore someone who is speaking to you, say please and thank you, don’t interrupt anyone and treat people nicely. That’s what being polite is. It’s being nice. Today, in a society so rarely face-to-face we’re forgetting to be nice. We’re defensive and suspicious, blocking out the world with headphones and commanding our attention away from those around us in our everyday lives. Rush hours of subways and buses crammed with people have their silence broken only by the squeal of the tracks or the dispersed chatter of groups of companions. Strangers brush arms and bump into one another as their jostled against the movement of the transit, but they keep their eyes glued to the floor, a phone, an advertisement on the wall or just stare, a dead-eyed stare at nothing at all. We shift uncomfortably under the gaze of anyone who looks at us and sometimes straight up ignore that rare person who tries to initiate conversation. As a woman, I’m guilty of not only ignoring a guy who tries to get my attention, but also going as far as to relocate myself to put distance between myself and the possible threat. That’s what people have become to us: threats or inconveniences. Instead of being polite first, we’ve gotten into the habit of being stand-offish and skeptical. It’s hard to break this habit though, and it’s questionable if we’ll ever be able to revive this dying trend of politeness. We’re a society that’s become impersonal. Connections are made online, dates organized via text, jobs applied to over email, interviewers following the initial googling of a candidate’s name. 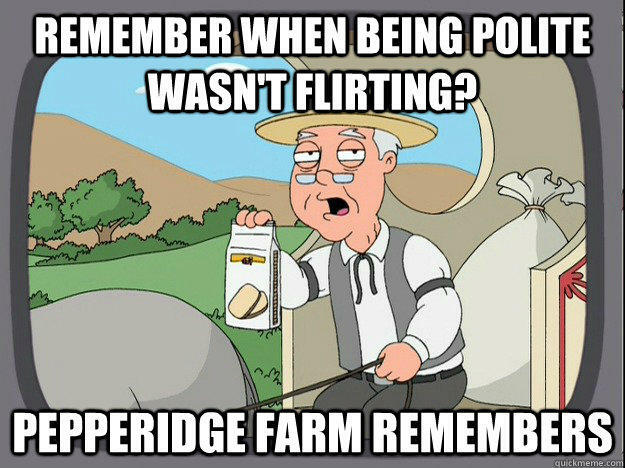 We’re forgetting that to be polite isn’t meant to be flirtation. To hold a door open for someone isn’t the first step in courtship, it’s being considerate. Replying to someone and affording them your full attention isn’t a green light for romantic advancements, it’s being a decent human being. I want to find the little girl who knew the difference without hesitation. Who not only understood what it meant to be polite but did it unconsciously, without fear of making a social faux pas. I want to be nice again. It’s a cruel truth that we get complacent with ourselves. Our looks, so easily noted by others, remain unchanged to our easy eyes. That mirror doesn’t have notifications that flash across its screen at the slightest change and so we watch, unknowingly, as our bodies morph. Then there’s this trigger that happens. Maybe it’s the subtle squeeze of old jeans or the shock of a picture your friend has taken of you in that bathing suit. All of a sudden, you know. You’ve gotten bigger. There are rolls where there weren’t before and you scrutinize yourself, offended for not having noticed the weight creeping onto you. You battle against this realization, asking ‘how’. You run through all the stats: My routine hasn’t changed in over a year. But I did move, and quit my job. I haven’t changed my eating habits in longer. But now I cook for two. I still run, work out, or do yoga throughout the week. But I allocate more of that time to writing now. Yes, I eat dessert once in awhile, but not religiously and i tend to avoid most sugars. It’s scary. My body has never turned on me like this, and now I panic. Isn’t that ridiculous? A body image scaring me. Pounds gained around my middle and thighs inducing panic. We try, as a society, to fight the expectations of media. We cheer Dove for their beauty campaigns that stand in proud contrast to the otherwise picture perfect models everywhere else. Yet, individually, we still unconsciously (and sometimes consciously) yearn to cheer in bodies that more resemble the models on Vanity Fair. It’s hardwired into us. It’s embarrassing to care; to admit that my aversion to swimming is rooted in the body I hide under my clothes. It’s embarrassing to doubt myself, especially when mine is a body that’s hiked, trekked, canoed, kayaked, won soccer championships and competed nationally in figure skating competitions. My body is strong. My body has been pushed and has surprised me again and again. It hasn’t let me down, and now I sit here scowling at it as though it were a foreign disease. I’m still beautiful. I’m still strong. And I’ll get even stronger. And I’ll get more happy with what looks back at me from the mirror, because I’ll work for it. I can step up my game. I wrote most of this post a month ago. Back then, I didn’t know how to end it. And I was embarrassed by the truth of it all. It’s been over 4 weeks now. And I have stepped up my game. I’m more fit now than I was all summer, and I can feel it. I don’t have to scrutinize a mirror image in search of the inches I’m wishing will fall off. My runs have gotten longer, I’m covering more miles in a shorter amount of time, and I feel great. There’s still so much more I want myself to accomplish, but it’s finally about what I want of myself rather than how I want myself to look. Sometimes it takes waking up fat to wake up.